In the far western part of the East Pacific basin, Tropical Storm Miriam is located more than 1,500 miles west-southwest of the southern tip of Baja California. This tropical cyclone will continue to gradually strengthen as it moves over very warm water and moist, unstable air. These favorable conditions should cause Miriam to become a hurricane within the next 12-24 hours. Miriam will pose no direct threat to land over at least the next five days, but large ocean swells generated by Miriam may result in higher surf along the east-facing coastlines of Hawaii toward the end of this week. Invest 90E has become Tropical depression 16 more than 420 miles to the south southwest of the southern tip of Baja California with maximum sustained winds of 35 mph. The newly formed tropical depression will be moving over warm water and through an environment of low vertical wind shear and sufficient moist unstable air. These favorable environmental conditions should support intensification into a tropical storm within the next 24 hours. It will then take the name Norman. The tropical cyclone will intensify further and should become hurricane Norman. 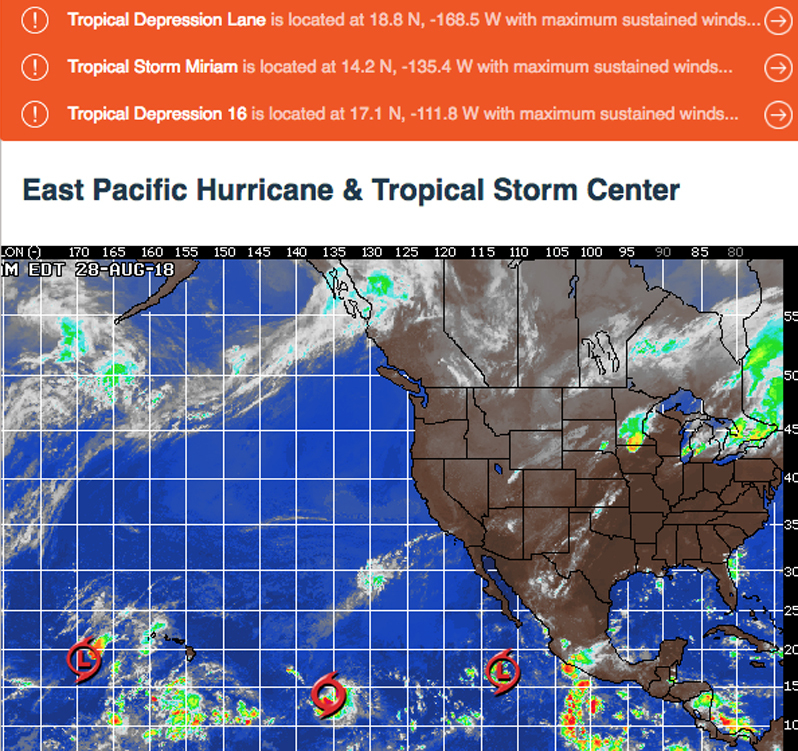 Lane is a tropical depression and continues to move away from Hawaii. A combination of drier stable air and very strong vertical wind shear will continue to weaken the system and it will likely become a remnant non-tropical low pressure area Tuesday. For Wednesday morning, if the models are correct, we should be able to squeeze out one more day of rather unimpressive wind swell in the waist high plus zone, for the top West facing beaches. Note the morning low tide and subsequent rise through the AM. The conditions look fair with 1-4 variable breezes until noon and 8-12 MPH out of the SW in the afternoon. The air temp hangs tough at 76 degrees. For Thursday morning the West facing breaks look to be toast with only knee high + boat wakes. The South facing breaks however will see some 16 second interval waves from a steep 180-185 degree angle. The sets should be waist high + and pack a little bit of a punch, but this energy will only get into the most exposed South facing breaks in the OC and San O’ areas. Once again an early low tide will cripple most spots for the dawn patrol. The conditions look fair again with 1-5 MPH variable breezes until noon and 8-10 MPH out of the SW in the afternoon. The air temp climbs up to 77 degrees. For Friday morning we’ll see more of the same, with the smallish, steeply angled, Southerly swell coughing up sets in waist high plus zone for the most exposed South facing beaches. That energy will fade out through the day. The conditions look pretty good again with 1-4 MPH variable breezes until noon and 7-9 MPH out of the SW in the afternoon. The air temp holds at a toasty 77 degrees. For Saturday morning we’ll see a little burst of NW wind swell which should put the best West facing breaks into the waist to possibly chest high range. There’s also a chance we could see some Hurricane energy seep into the most exposed South facing breaks but nothing is etched in stone just yet…. stay tuned. The conditions look decent with variable S/SSE winds in the 1-4 MPH zone until noon and 7-9 MPH in the afternoon. The air temp tops out at 80 degrees. For Sunday morning we should see a continuation of that NW wind swell with waist high + surf for the top West facing beaches. Tropical Hurricane swell remains a possibility but I am making no promises just yet. Those spinners have a mind of their own so check back on Thursday for the latest scoop. The conditions look pretty good with SE/SSE breezes at 2-4 MPH until noon and 7-9 MPH winds out of the SW in the afternoon. The air dips a hair to 78 degrees. Water temps are still nice and toasty! (day of 4CAST update) and are as follows: Malibu 67, Santa Monica 71 South Bay 78, Huntington 66, Newport 68.